John Chumack took this image featuring the nucleus of Comet Lovejoy on Nov. 13, 2013 from his observatories in Yellow Springs Research Station in Yellow Springs, Ohio. He used his homemade 16" diameter F4.5 Fork Mounted Newtonian Telescope and QHY8 cooled color CCD camera to take the photo. Comet Lovejoy soars in these stunning images recently sent to SPACE.com by an avid astrophotographer. "Comet Lovejoy has become spectacular!" astrophotographer John Chumack wrote SPACE.com in an email. Chumack captured the images on Nov. 13, 2013 from his observatories in Yellow Springs Research Station in Yellow Springs, Ohio. He used his homemade 16" diameter F4.5 Fork Mounted Newtonian Telescope and QHY8 cooled color CCD camera to take the photos. 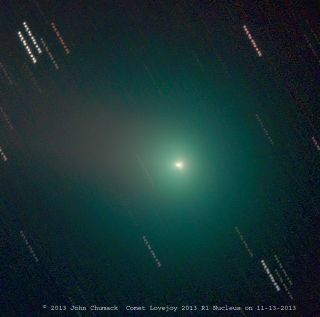 John Chumack took this image of Comet Lovejoy on Nov. 13, 2013 from his observatories in Yellow Springs Research Station in Yellow Springs, Ohio. He used his homemade 16" diameter F4.5 Fork Mounted Newtonian Telescope and QHY8 cooled color CCD camera to take the photo. Australian amateur astronomer Terry Lovejoy discovered the new comet — his third discovery — on Sept. 7 toward the southeast of the constellation Orion. Lovejoy, designated C/2013 R1, is quickly brightening on its way toward the sun. It will arrive at perihelion, its closest point to the sun, on Dec. 22 at a distance of 75.4 million miles (121.4 million kilometers).